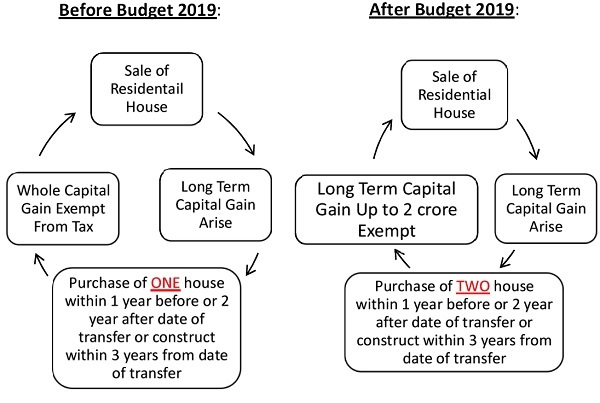 Unbelievable change in budget 2019 about tax saving on sale of Residential house property under Section 54 of Income Tax Act, 1961.Inter Budget 2019 has proposed rollover of capital gains under Section 54 of the Income Tax Act from investment in one residential house to two residential houses for a taxpayer having capital gains up to Rs. 2 crore.This benefit can be availed once in a life time. Here we have mentioned the Proposed Amendment in Section 54 with example to help you plan your capital gain tax. Mr. Ronak sells a long term residential house property in Ahmedabad for Rs.2,00,00,000. it is assumed that Index cost of acquisition is Rs. 70,00,000. After 2 months, he purchase one house in Rajkot for Rs. 80,00,000 and after 5 months he purchase second house in surat for Rs.50,00,000. Calculate capital gain chargeable to tax. Option can be exercised once in life time.